LATEST: Developer HIPP Investments was set to unveil its plan for the historic theatre this month (February 2019), but said more work needs to be done to get the project right, reports the Brighton & Hove Independent and the Brighton & Hove News online. This is hopefully an encouraging sign that they really want to do it right. 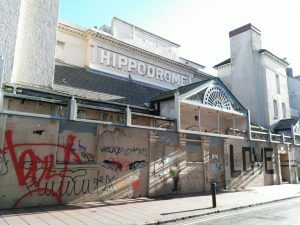 Good news for the Brighton Old Town Conservation Area in which sits the Hippodrome at its heart, is that the City authorities have approved the conservation plan – read on. The new owner has yet to make a formal planning application (July 2018) but meantime a draft report on the Old Town Conservation area commissioned by Brighton & Hove City Council states “The Hippodrome…together with land to the north of it and the car park to the east…is the single most significant vacant building or site in the Old Town and is the key to revitalising Middle Street and the wider Old Town area.” Crucially adding “The council will expect any acceptable scheme for the site to fully restore the Hippodrome for a use that retains the auditorium as a single open volume capable of maintaining a performance function together with the conservation of the other front and back of house spaces…that contribute greatly to its significance.” It is important that these requirements, amongst others, make it to the final version. Special vigilance is required following subsequent reports in local media claiming that the development plan is still to build a hotel on the theatre get-in yard which would render it inoperable. The local Brighton Argus online newspaper previously reported that Academy Music Group has completed the sale of Matcham’s iconic Grade II* Hippodrome to developer Mosaique whose chief executive Aized Sheikh announced plans for a development of a boutique 5 star 70 bed hotel, 25 high end serviced apartments and a concert, theater[sic], conference and banqueting venue. This is the company behind the nearby Worthing Teville Gate project which has been long in planning. It’s too early to know how the additional components will be fitted alongside the Hippodrome as the developer has not yet announced any detailed proposals or made an application. At first glance, it would seem that Brighton does not need another hotel, but could really make use of restored theatre able to take the big shows. The CIC and local campaign have cautiously welcomed the end of a long period of doubt over ownership. Academy Music Group (AMG), the major music venue operator, purchased the freehold of Frank Matcham’s Brighton Hippodrome in 2015 but the City authority looked set to refuse a licence for music venue use. 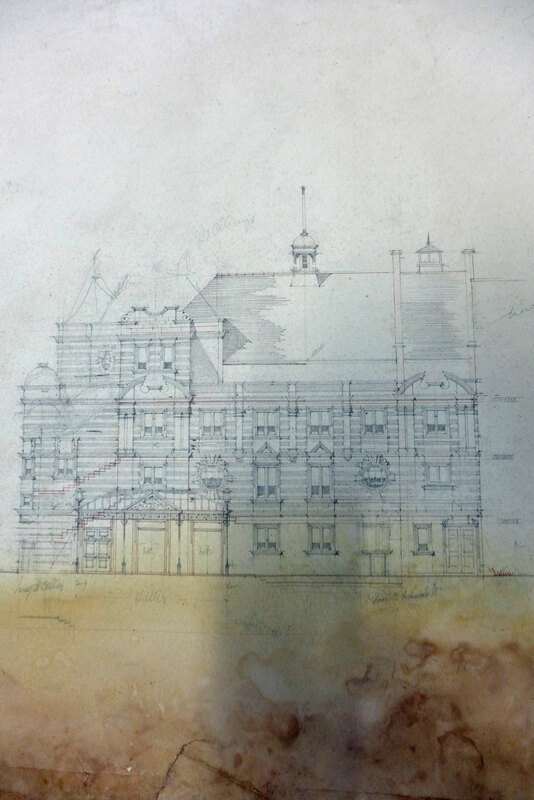 AMG then engaged with all the main stakeholders, including the Frank Matcham Society, to carry out a six month viability study to identify a future use for this unique Grade II* former circus variety theatre. The report concluded that there is a future for the Hippodrome. Brighton Hippodrome CIC has been set up to raise funds to hopefully purchase the building and lead a development project, with the stakeholder group acting as advisors. See the Brighton Hippodrome CIC Partnership statement here. This great survivor is the most important of Frank Matcham’s works no longer in beneficial use. It is heading the Theatres Trust 2019 list of Theatre Buildings at Risk and it is in the top six percent of all listed buildings in the UK and has the potential to be a major cultural asset to Brighton and the region. See the current Theatres Trust risk assessment update page and view the excellent campaign (2016) video. Please continue your support so that this opportunity is not to be missed to make it so. Follow the Our Brighton Hippodrome campaign news pages here. It is a sad reflection on our government, local authorities, listing processes and the property owners desire for maximising the amount of money to be made, all at the expense of the communities they claim to serve, that so many theatre buildings have been lost to car parks, luxury apartments or student flats, without any thought to what created the community and would maintain it to entertain and enrich the peoples lives. Hundreds of theatres have been lost and more are still at risk. Click here to view the Theatres Trust 2019 list of Theatre Buildings At Risk with Streatham Hill Theatre’s asset of community value designation being challenged by the owners, and Margate’s Theatre Royal jewel box open but struggling, and others, now added to the Theatres Trust list. The Theatres Trust wants your memories of the theatres that feature on its Theatres At Risk list. See their Share Your Memories page here for how you can help and contribute. See also our News updates here and our News Features page here which have more information on the plight of theatres at risk. In some cases, theatres lost to demolition are replaced by a new theatre. Unfortunately this is not always the case. 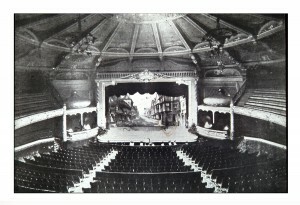 The Theatres Trust publishes a list of all theatres by town, including those in other uses, disused or demolished. 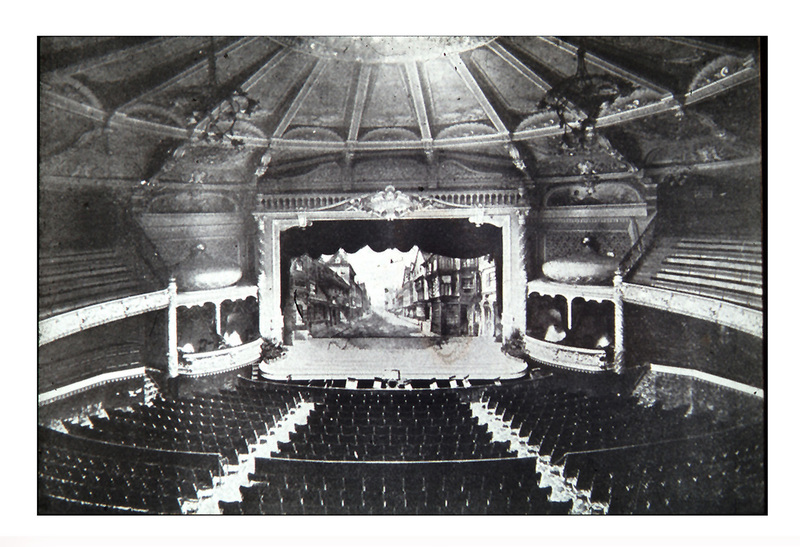 The incomparable Arthur Lloyd website also has a list of London’s lost theatres which includes historical details and many illustrations. 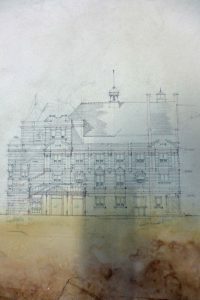 It is also possible to search for more information about recently lost theatres such as the Nelson Palace, now a parking lot, and the Wallsend Borough, demolished for affordable housing, and now joined by the Scarborough Futurist for who knows what. Scarborough council gave themselves permission to demolish the Futurist, a working theatre when they closed it, to be replaced by a small theme park at high cost but with no agreement with the rumoured operator, and despite a strong local campaign. Appeals to Historic England to list it, and for the Secretary of State to call in the action, fell on deaf ears. Demolition was complete in August 2018 – theatre lost. Dudley where the council has foreclosed on the Hippodrome lease to the local campaigners in order that they can demolish this striking art deco structure from 1938 by Archibold Hurley Robinson replacing an opera house on the site but lost to fire. The campaign was vigorously supported by the Theatres Trust prior to this and the building is in good condition due to a long period on bingo. Derby Hippodrome is still largely roofless when the owners’ contractor sent to carry out repairs, removed a large section instead. Several small fires and now creeping vegetation have contributed to increasing dereliction. However, it is not lost yet and a new campaign has just started. London Borough of Southwark, a cradle of early theatre, has given their developer partner permission to demolish the Elephant & Castle Coronet, a substantial rebuild of Frank Matcham’s first theatre into a cinema, but with Matcham’s DNA in it’s structure. Formal planning approval recently given but still no replacement announced. Plymouth Palace is now suffering increased dereliction since a charity attempted restoration in the face of reluctance by the city authorities to find a solution to inaction by the owner. Eccles Crown has lost it’s stage house and parts of the auditorium behind the thankfully intact facade, whilst the owner makes inappropriate planning applications. A local campaign seeks a solution but recent reports (February 2019) suggest that approval for flats on the site has now been given. This, Hulme Hippodrome and Salford Victoria are three of several theatres around Greater Manchester at risk but with huge amounts of public funding going into city centre projects. To all those fighting to save your theatre – do not give up – it is not lost until it has gone. Bradford’s Odeon (New Victoria) cine/variety theatre, originally thought lost to a government regeneration project, is now a work in progress towards re-use. Stockport’s Globe cine/variety theatre, flooded and thought hopeless, now has local authority support for re-purposing with work continuing. London’s Alexandra Palace theatre, long disused and forgotten, has reopened following sympathetic restoration that retains historical elements, but with new facilities for the audience.